Have you ever stopped to consider what really happened on the Day of Pentecost, which the “Church Calendar” notes is the first Sunday of this month? Omigosh! The magnitude of what God did on that pivotal day He had so long awaited is something I want to truly understand, never take for granted, and practically apply in my life so as to maximize His investment in me, an investment that cost Him the life of His Son. Last month’s WWF teaching is titled “God, Jr.”, A Chip Off The Old Rock, with the sub-title: The Magnitude of Being IN CHRIST—and I think it will amplify for you what you will read here, in terms of the uniqueness of what we have in our new birth. I show how we as the One Body of Christ, the Church, have something far greater than the “New Covenant” that Israel will have. As a member in particular of that One Body, you are permanently IN CHRIST and have the same righteousness that he earned by his obedience all the way to the Cross. Like Jesus, you bear the family Name of your heavenly Father, are filled with His divine nature, and are a joint-heir with him. When God looks at Jesus, He sees you. Let’s see if we can set forth the biblical components of what God did in the glorious moment described in the following verses. By the way, it really happened! 1 When the Day of Pentecost had fully come, they were all with one accord in one place. 2 And suddenly there came a sound from heaven, as of a rushing mighty wind, and it filled the whole house where they were sitting. 3 Then there appeared to them divided tongues, as of fire, and one sat upon each of them. 4 And they were all filled with [holy spirit] and began to speak with other tongues, as the Spirit gave them utterance. What happened was the largest multiple birth in history—“about 3000” people became the first humans ever to be “born again of incorruptible seed” (1 Pet.1:23) and have permanent salvation. What happened was that the risen, ascended, and exalted Lord Jesus became the “head over all things to the church, which is His body, the fullness of Him who fills all in all” (Eph. 1:22-23). What happened was that just as God breathed life into the first man, Adam (Gen. 2:8), so on Pentecost He breathed life into the “one new man” (Eph. 2:15), the Body of Christ. What happened was that the Lord Jesus, who while on earth could be in only one place at a time, would from then on be diversified around the world in a multi-variegated, multi-faceted, multi-lingual, multi-talented body of people empowered with the same holy spirit he had, and who could do the works that he did. What happened was that “now the manifold wisdom of God might be made known by the church to the principalities and powers in the heavenly places, according to the eternal purpose which He accomplished in Christ Jesus our Lord” (Eph. 3:10-11). What happened was that those first Christians received “the firstfruits of the spirit” (Rom 8:23) that God had promised many times in the Hebrew Scriptures (e.g., Jer. 31:31ff; Ezek. 37:11-14; et al). Now YOU TOO have within your “earthen vessel” body the same holy spirit that will one day animate the resurrected bodies of all those who believed from Genesis up until Pentecost. WOW! How awesome is that?! What happened was that they received POWER when the gift of holy spirit was given to them, and they became the Lord’s witnesses wherever they went. The Book of Acts shows us what they did with that power, and what we too can do with it. GUESS WHAT? All of the above also happened on your “New Birthday,” your personal Pentecost, when you became a child of God forever. The popular and prevailing lies that “God is in control,” that He “allows” evil, that Satan must ask His permission to hurt people, and that everything that happens is the will of God conveniently absolve the individual of any personal responsibility. In contrast, one of the most vital and liberating truths you and I have been privileged to learn is that of The Giver and the gift. 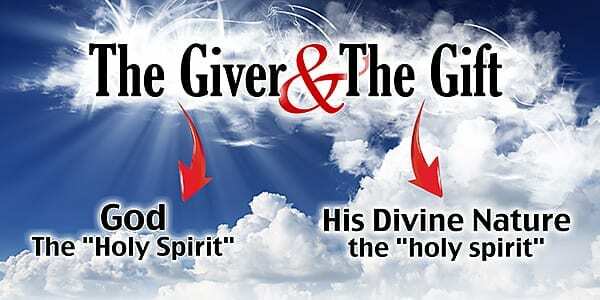 On that Acts 2 Pentecost, God, “The Holy Spirit,” The Giver, first poured into the hearts of men His gift, His divine nature, holy spirit, by way of His risen, ascended, and exalted Son, the Lord Jesus Christ. Since that day, each Christian has the freedom, and the responsibility, to choose for himself what to do with that precious gift. In large part, the degree to which the will of God comes to pass on the earth is up to us. Just as God needed David in order to stop Goliath, so the Lord Jesus needs YOU to stand against evil and bring light and love to this dying world. 17 Now the Lord is the Spirit; and where the Spirit of the Lord is, there is liberty. 18 But we all, with unveiled face, beholding as in a mirror the glory of the Lord, are being transformed into the same image from glory to glory, just as by the Spirit of the Lord. 4:1 Therefore, since we have this ministry, as we have received mercy, we do not lose heart. 2 But we have renounced the hidden things of shame, not walking in craftiness nor handling the word of God deceitfully, but by manifestation of the truth commending ourselves to every man’s conscience in the sight of God. 3 But even if our gospel is veiled, it is veiled to those who are perishing, 4 whose minds the god of this age has blinded, who do not believe, lest the light of the gospel of the glory of Christ, who is the image of God, should shine on them. 5 For we do not preach ourselves, but Christ Jesus the Lord, and ourselves your bondservants for Jesus’ sake. 6 For it is the God who commanded light to shine out of darkness, who has shone in our hearts to give the light of the knowledge of the glory of God in the face of Jesus Christ. As you rivet the eyes of your heart on Jesus Christ, allowing nothing within you to come between you and him, you are transformed from the inside out, and you reflect his glory to those around you. As Christ is the image of God, so we are the image of Christ. We are THE FACE OF JESUS CHRIST to the world. Think about a face. Not only is it unique to each person, it also contains the eyes that see, the ears that hear, and the voice that speaks. As the FACE OF JESUS CHRIST, we can look at people with eyes of love, hear the cries of their hearts, and speak to them words of life. And we do so empowered by the same divine nature and holy spirit power that he so vividly manifested. Go for it! And don’t forget to smile.